Are You Creative, Crafty, Arty …. … Do you design and hand craft quality products? Do you live in Melbourne and looking for a warm, friendly and exciting place to exhibit & sell your wares? The Handmade Show could be just for you. This is where we showcase the talents of local artisans and crafters. Perhaps you would like to join us! 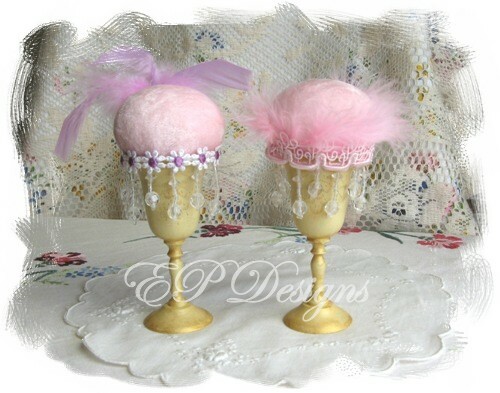 Our focus is on quality handmade products, and we love to exhibit a large range of crafts. We are on the lookout for unique, well made products that are locally made in Melbourne. As you would know, most markets charge you a fee for holding a stall. The Handmade Show operates a little differently because we (the artists & crafters) run the market ourselves. We are a non-profit group that all share the responsibilities of running The Show, and therefore a donation from each of our stallholders is requested to go back into the general costs of running The Show. A portion of this also goes back into the RSL. Interested in becoming a stallholder or would like to know more? Please visit The Handmade Show blog to register your interest, and you will be sent an application kit! My collection of old & worn silverware includes these liqueur/sherry stem goblets which have been painted & given some gold antiquing. I’ve added a big handful of craft stuffing contained within a covering of crushed panne velvet, to form a round ball for the a pin cushion. 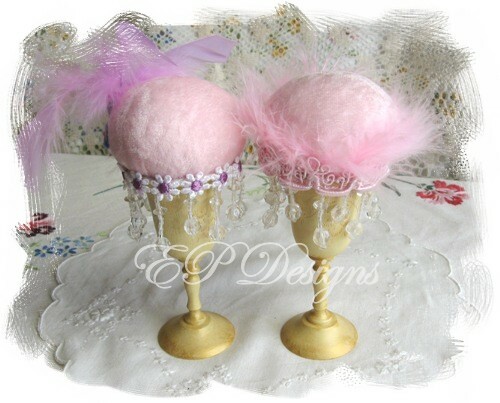 The cushion & beaded fringing are fixed firmly onto the goblets …. but the lace & feathery embellishments are only pinned into place at the moment. The look may change slightly when I eventually finalise these trims. So far the above design is my favourite, but I have more designs on the go – these will all be available for sale as soon as they’re finished. There are many wonderful entries for Pink Saturday which is hosted by Beverly at How Sweet The Sound. Take time to visit other participants’ blogs and see how Pink everyone’s Saturdays can be – you won’t be disappointed. Look at what I received in the mail! It’s just perfect to share with you today. Welcome to Pink Saturday ! Many of you would remember that before Christmas I held a Giveaway here and sent off prizes to the winners. 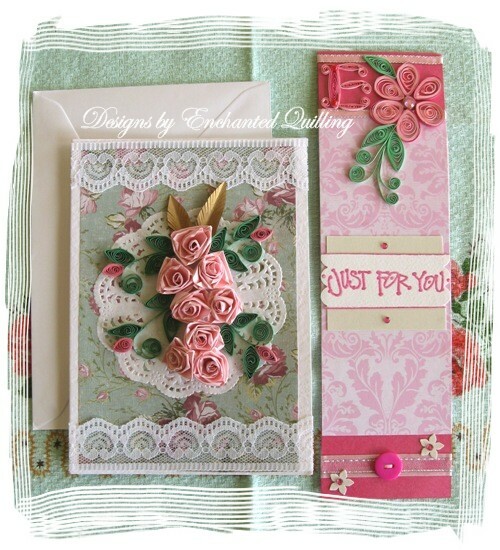 Janice from Enchanted Quilling was the winner of the main prize and she had a little surprise in store for me too. 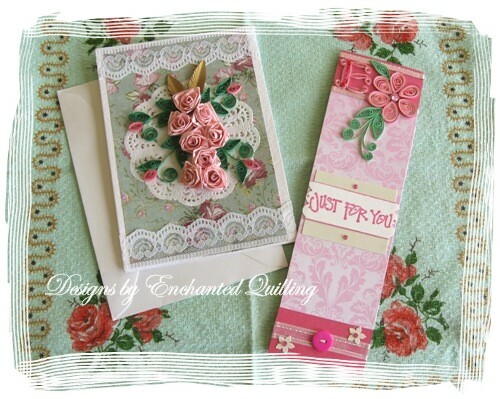 How gorgeous are these – a beautiful pink roses card and a delightful bookmark. It’s sooo nice receiving surprises in the mail. 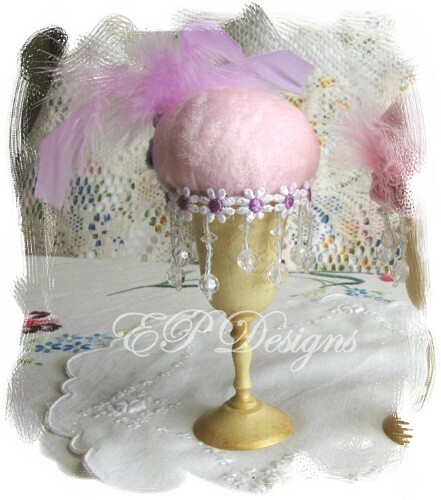 Janice creates some beautiful designs so do pop over and check out all her gorgeous goodies. Thank You Janice – they’re a lovely surprise to receive. …. 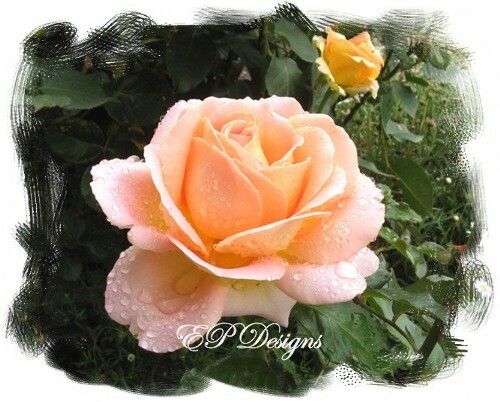 and here was this gorgeous rose the day after the rains – my friend drew my attention to it and of course I couldn’t resist taking the photos. Beautiful, Beautiful – a reminder that we Must take time out in our busy lives (whether it’s family life or work) to ‘smell the roses’. It keeps us healthy, puts a smile on our faces and, while enjoying the beauty around us, we momentarily forget all the things that weigh us down. It may not solve our problems & worries but it injects new energy & refreshes us so that we can keep on going. 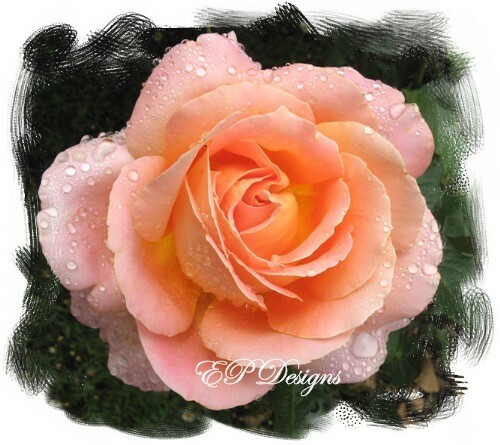 I could’ve missed out on seeing this gorgeous rose – I’m so glad I didn’t. I hope you enjoyed this week’s entry. I believe everything is now back to normal with my computer & blogs so I’ll be able to visit more & get back into the Pink Saturday challenge by next week. The number was generated via Random.org. I will be in touch soon to collect your details.